Transmit your data at high speeds and at longer distances with the Duplex ST to Duplex LC Singlemode Fiber Optic Patch Cable from Camplex. This 49.2' cable comes with an orange OFNR jacket that covers a 9μm core along with 125μm of cladding. Camplex has outfitted this cable with a ST duplex connector on one side and the other end features a LC duplex connector. Furthermore, ceramic ferrule is used to offer precise alignment of the fiber cable as well as increased reliability. 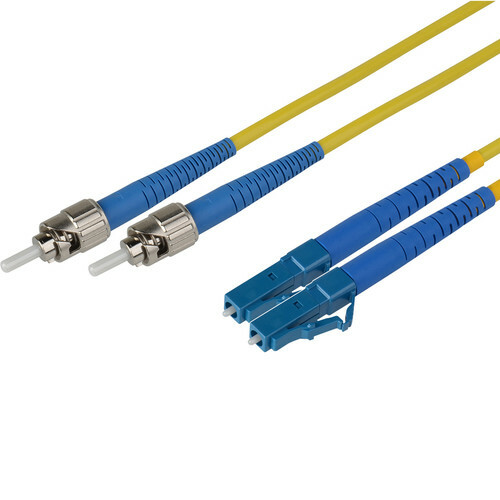 Box Dimensions (LxWxH) 8.0 x 6.0 x 0.03"
Duplex ST to Duplex LC Singlemode Fiber Optic Patch Cable (Yellow, 49.2') is rated 2.0 out of 5 by 1. Rated 2 out of 5 by Kayla from Atrocious Lead Time Took over 20 working days for this to ship. Otherwise, worked fine. Good, cheap, quick-pick two.